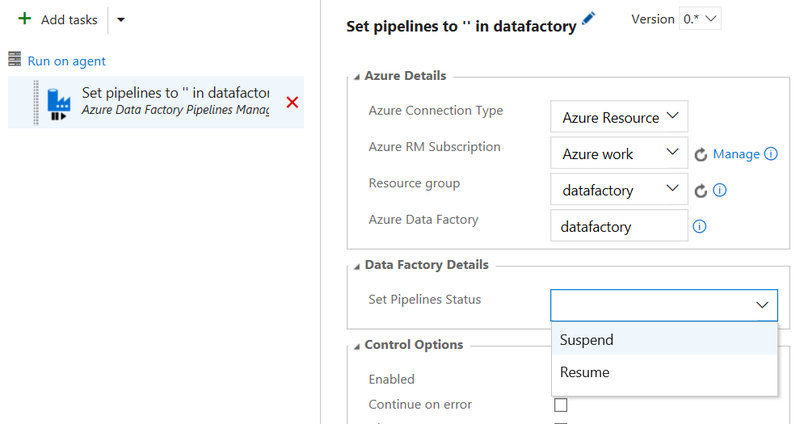 This release task can be added to a release pipeline to either suspend or resume all pipelines of an Azure Data Factory. Set Pipeline Status - Option to set the status all the available pipelines to either 'Suspend' or 'Resume'. Parallel tasks - [Future use]Option to set the number of parallel processes. If you have any comment related to the documentation, like corrections, unclear features or missing documentation, feel free to leave feedback below via GitHub. Or correct it yourself and submit a PR; see CONTRIBUTING.md for more details. GitHub account required.